I love early mornings in Chinese parks. It is that time of the day when the temperature is still moderate and the tourist masses have not arrived yet. The park is full of people dancing, singing, practising Tai Chi, playing Mahjong. There is a nice, peaceful atmosphere. A rare thing in a megacity like Beijing. 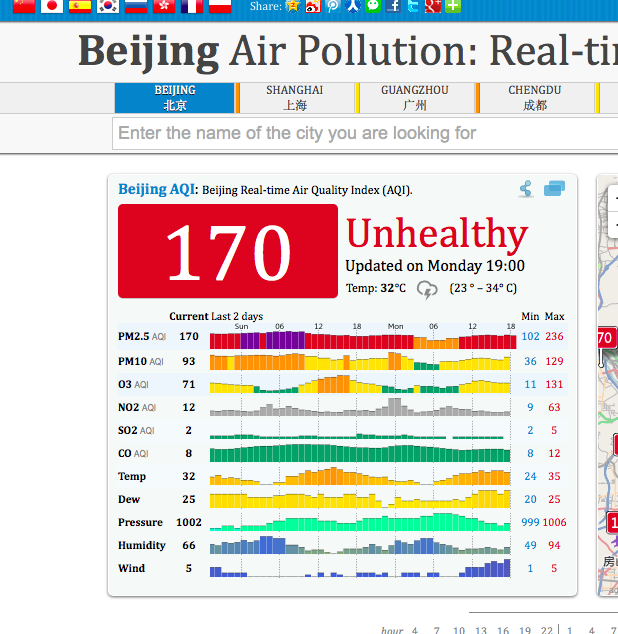 Having been in Beijing for almost 4 months now I know how rare it is to wake up to a day without pollution. On most days the pollution level is classified as unhealthy and then there is an approximately equal amount of days when the air is classified as very unhealthy or moderate. And then there are a few days when you can read: hazardous/or even beyond index or GOOD. Over the last 4 months I have experienced around 5 days when the air was classified as good so you can understand how special those days are for most people living in Beijing. Photos of the blue sky circulate the social media, it might even make the front page of the newspaper. It is all that people talk about and everyone seems to be in a much better mood. I remember 4 years ago when the government still told people that Beijing was a foggy city, how they explained the rapidly increasing cancer rates – I don’t know. 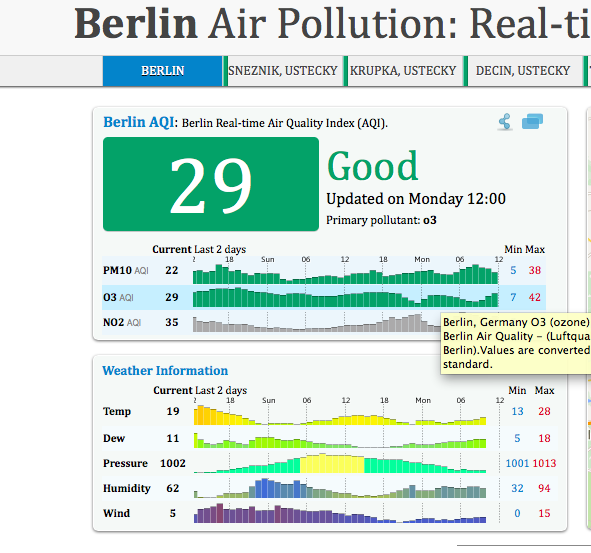 That time the website of the US embassy, which published the air quality measurements, was not accessible. Later on the Chinese government did start publicising air quality ratings. However, surprisingly enough on what looked like an extremely polluted day the U.S Embassy’s monitor indicated that the air quality was “hazardous” and “beyond index, but “the Chinese government’s official Air Pollution Index indicated that the air was only “slightly polluted. It turned out they just measured different pollutants – obviously the US the much finer particulate matters. But back to my morning in the park on a good – moderate air quality day. 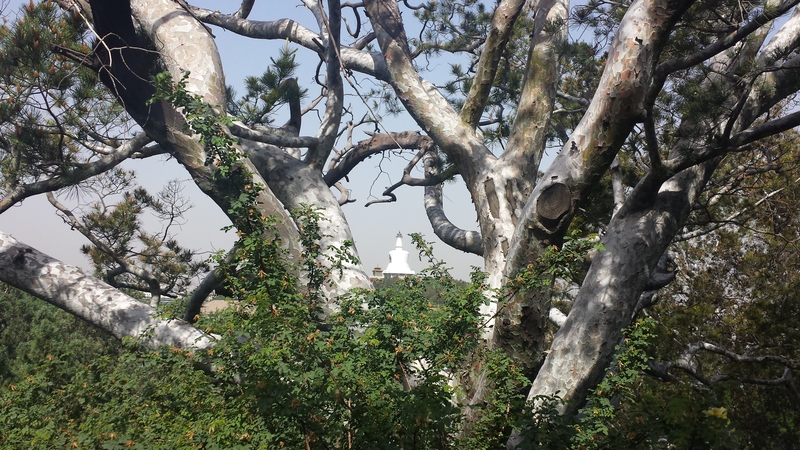 I got up at 7am, looked out of my window, hopped on my bike and cycled to Jingshan Park. 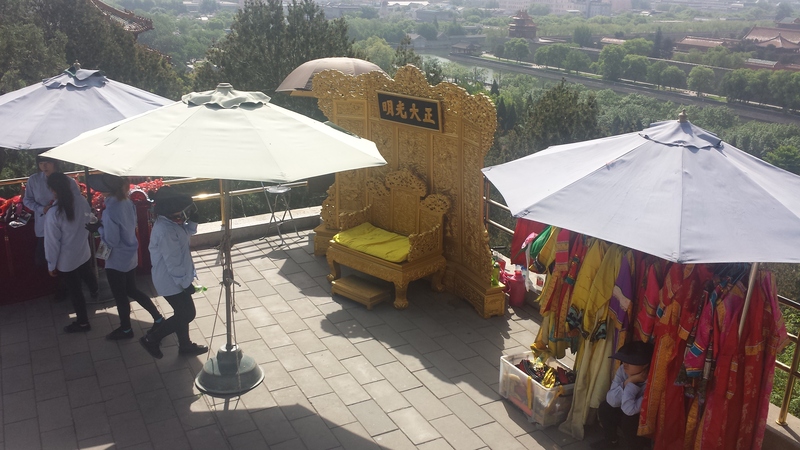 And if you would like to feel like a Chinese emperor once in your lifetime you can get your picture taken right here… they even provide you with an “authentic” outfit. 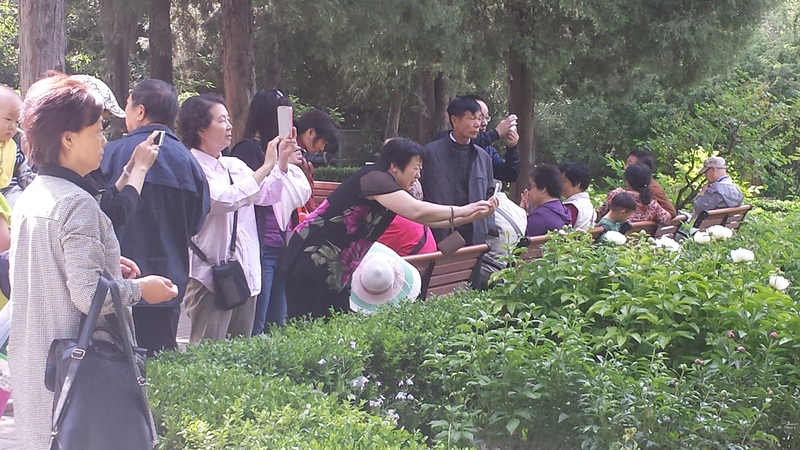 Chinese people LOVE taking picture of flowers. Why? I actually don’t know.. maybe it is because of the fact that in a city like Beijing you don’t necessarily see flowers apart from being in a park. So, whenever you see a crowd of people with their phones, selfie sticks and what not, you can expect that there is a blooming flower close by which caught their attention. A lovely way to spend a morning on a good day in Beijing. you are getting better at this! very well done. very interesting for people like me who have never been there. thanks for that, verena. keep it up!